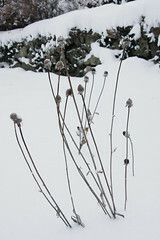 Black-eyed Susans (Rudbeckia) seed heads just after a huge winter storm here in Massachusetts. It snowed all weekend, I shoveled my walk and driveway 3 or 4 times, did manage to get out to pick up J&M as they returned from Palm Springs - when they left it was a balmy 72F. Welcome back! And happy winter to all. Just stopping by to say hello, that is a great shot. Heck of a storm. I shoveled on Saturday morning, then decided to wait until it was all done before doing so again. Luckily, my landlord shoveled the rest before I got my act together again. Sometimes it pays to procrastinate! Happy Winter to you too! So far not enough snow to shovel! Thanks again for the lift home! Slept almost all day within minutes of getting inside!